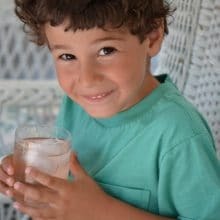 Home » Rose Water & Orange Blossoms Blog – Fresh and Classic Lebanese Recipes » Stories and Recipes » Pastry and Sweets » Perfect Chocolate Chip Cookies, and it’s a beautiful day in the neighborhood. 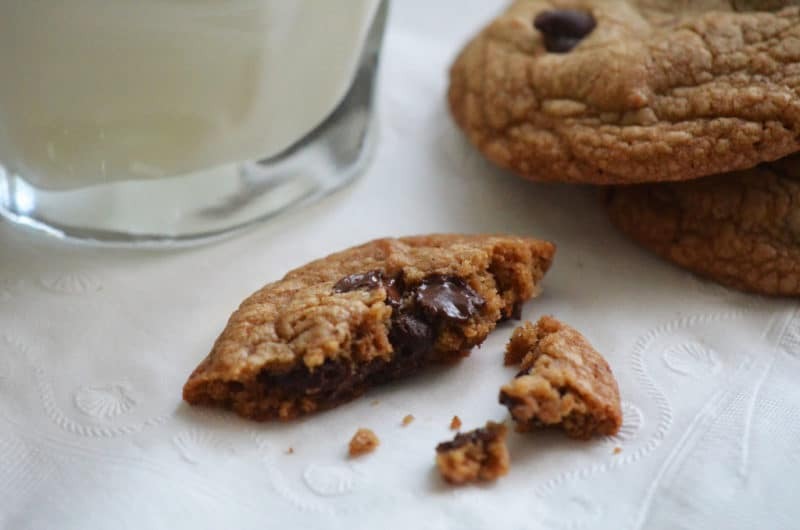 What makes these perfect chocolate chip cookies? Browned butter, dark brown sugar, and a bowl-and-whisk method you’ll love. Hands down our favorite chocolate chip cookie. Other cookies you won’t want to miss are these butter cookies, blondies with tahini and caramel, crunchy sesame cookies, and jam thumbprints, and chocolate crinkles. The value of a good next door neighbor is not to be underestimated. Living for years in anonymous city apartments on anonymous streets was enough to make me appreciate what we had growing up on Wagon Wheel Lane. My parents moved to their new home there in June 1968. They had four children, and the youngest at the time, me, was a newborn. Not too long after that, number five arrived. If my mother thought she was busy making a lot of bologna sandwiches, she needed only look to her right to see Barb Georgi with her five children, to her left to see Dee Zawacki with her three girls, or across the street to see Ellen Fata with her six, to know that she was in good company. These women of Wagon Wheel Lane were not desperate housewives. They took care of their own, and their neighbors. My mother loves these women as sisters, and they love her right back. Mrs. Georgi taught me how to swim. Sure, I had taken real lessons, and hated them. My scrappy little frame was nowhere near up to the challenge of swimming the full length of an Olympic-sized pool, and essentially, I failed. Still, along with all of my siblings, I was swimming almost daily next door. Mrs. Georgi kept an open-gate policy for us, and we tip-toed through the yard and past the back porch where Mr. Georgi was taking his nap after a long day at work in his butcher shop. Barb joined us in the pool and would not accept that I failed my swim class. She taught my sister and me to float, and then to swim the width of the pool, then the length. I think it was her smile that calmed me down and inspired in me the desire to bake chocolate chip cookies and take them to her back door (or was it her son Jim, the boy next door, who inspired that in me? She raised the kind of son who would embrace me just after my shattered-dreams divorce as we buried my sister-in-law, when I wondered aloud where in the world I would be buried one day. He said: “your husband will want you with him.”). Barb knew how to make a kid feel special. When I graduated from high school, she gave me a leather stationery set with my initials on it, and inside was a prayer card, worn at the edges, that she told me she’d had since she was a girl. Now it was mine to pray, she said, so it would keep me safe and sound. And it has. She’s also the only person besides my mother who has looked into my eyes in the afternoon sun and noticed that they are more green than brown, more like hazel, and said so. Mrs. Fata is the Italian mother every person should get to grow up across the street from. In that house she and her family have made their own wine, stuffed their own sausage, and feasted on the seven fishes every Christmas Eve. When Ellen talks, you listen, because she says things with such humor and invites you in for a taste of whatever is bubbling on the stove; that’s after she’s gone to daily Mass every morning. The delivery truck from their family wholesale food service business used to back up into our driveway and load our basement cabinets with things like hot fudge sauce in individual cups and frozen raw pizza rounds for baking with your own sauce and cheese. When my grandmother died, Phil Fata brought over the most delicious lasagna any of us has ever eaten, and he says “it was just lasagna” when we ask him how he does it. Phil has the distinguished honor, along with my brother Tom, of authoring the graffiti in the little room under the basement stairs that reads to this day: “Tom and Phil is cool.” Ellen’s husband Frank was one of my father’s best friends. They were such good friends they decided to die the same way, of pancreatic cancer, a few years apart. Mrs. Zawacki has the greenest thumb on the planet, and spends her spring, summer, and fall days in the yard. She keeps a bird bath in view from her kitchen window, which I think she said her husband Bob put there for her when their youngest, Elaine, was born. Mrs. Z. kept a Polish kitchen and that meant we had plates of her chrusciki, ethereal fried cookies crowned with powdered sugar. The three Zawacki daughters were blonde movie stars, and Elaine was our favorite babysitter. She taught me how to peel a peach by immersing it in a mug of hot water, so the skin slips right off. When Mr. Zawacki died unexpectedly, and too young, just before Elaine was to marry Ed, another movie star, she sat in our sunroom talking quietly with my parents about what to do. Have the wedding, they said. That’s what Bob would have wanted. Bob was the kind of guy who built his own sailboat and then took all of my brothers out on the lake with him for his maiden voyage. All of the neighbors had dogs, Tanya and Cocoa and Shadow. This gave us a nice taste of doggie-fun without having one ourselves (ok, there was Mandy, but that was only a three-month affair). I won’t mention Minka, the dog of the neighbor behind us who pummeled me one morning for cutting through his territory. We used to shoot like lightening to the top of the monkey bars in the backyard whenever Minka came round, and yell out “Go home, Minka!” That dog had fangs and could bark like a sonofabitch. But I could scream louder. The women of Wagon Wheel Lane all became widows. Mrs. Zawacki was the first, and Mrs. Georgi was the last. Her husband Bob, a WWII war hero and man of great charm, died early last year. Then Barb followed him out the door last week. After the funeral there was a luncheon, and on the wall a slideshow recounted the years and the fun and the love. I cried like a baby through the whole thing. Of course we weep for ourselves when we weep for the death of another. But I also wept for our now empty, for-sale house on Wagon Wheel Lane, and how lucky we were to grow up in a place where you really did walk next door to borrow a cup of sugar from the neighbors. I've adapted this excellent recipe from Cook’s Illustrated. Their trustworthy test kitchen recommends Ghirardelli chocolate chips, and so do I. 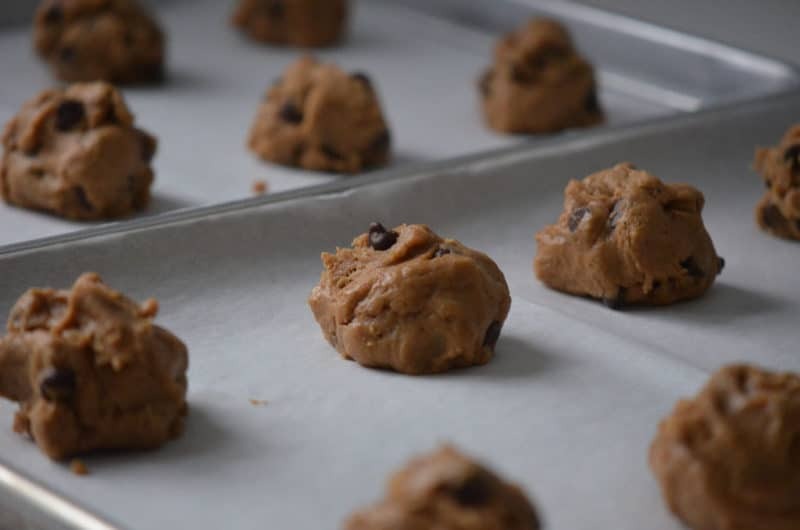 Do use fresh dark brown sugar (don't substitute light brown) and unsalted butter; salted butter has more water in it and that affects the cookie texture. Remember a few baking basics, and you’re going to have boy-next-door-worthy cookies in no time. These cookies taste divine when reheated in the microwave for 10-15 seconds. The chocolate melts and gets all over your fingers. Chase with a glass of cold milk, and baby, that’s all she wrote. Adjust oven rack to middle position and heat oven to 375 degrees. Line 2 18- by 12-inch heavy baking sheets with parchment paper. Whisk flour and baking soda in medium bowl; set aside. Heat 10 tablespoons of the butter in skillet over medium-high heat until melted, about 2 minutes, swirling pan constantly until butter is dark golden brown and has nutty aroma, 1 to 3 minutes. Take care not to burn the butter (it can happen quickly). Transfer hot browned butter to large heatproof bowl. Stir remaining 4 tablespoons butter into hot butter until completely melted. 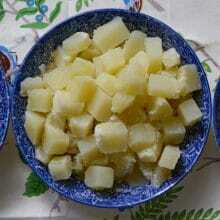 Add both sugars, salt, and vanilla to bowl with butter and whisk until fully incorporated. Add egg and yolk and whisk until mixture is smooth with no sugar lumps remaining, about 30 seconds. 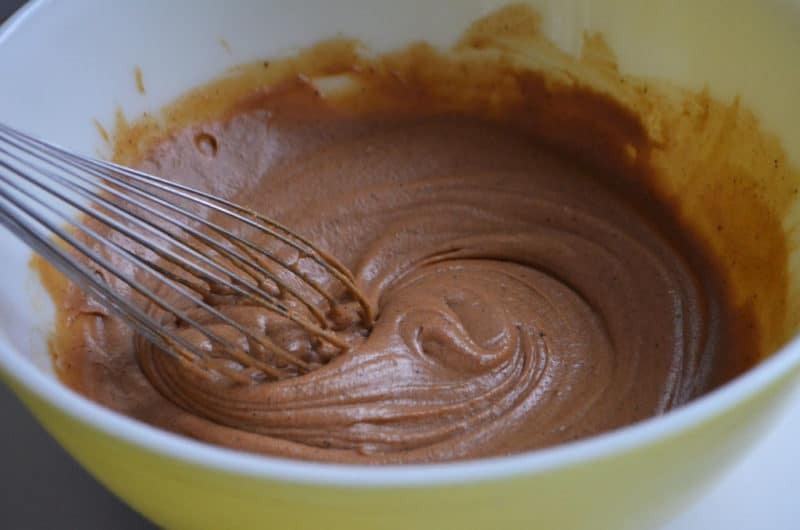 Let mixture stand 3 minutes, then whisk for 30 seconds. Repeat process of resting and whisking 2 more times for a total of four times until mixture is thick, smooth, and shiny. Using rubber spatula or wooden spoon, stir in flour mixture until just combined, about 1 minute. Stir in chocolate chips and nuts (if using), giving dough final stir to ensure no flour pockets remain. Chill the dough for 20 minutes. 40 Responses to "Perfect Chocolate Chip Cookies, and it’s a beautiful day in the neighborhood." Maureen, you sure have a gift, please keep it up. I also knew the Fata’s, wonderful parents. Thank you so much Greg. The Fata’s are the best of the best kind of people. Again, my heart is full with tears of joy and tears of happiness at your memories, your lovely words, and your loving descriptions. You write for us ALL! And I shall try this divine recipe for perfect chocolate chip cookies. You are a treasure, blessings for you on this day, and, for you, always! You keep me going Diane, thank you! xo. Wonderful as always – loved “Tom and Phil is cool” – what a blessing to be surrounded by all of that love, support and good food when you were growing up. I failed swimming class as well because I couldn’t swim the length of the pool, I was such a scrawny thing that it took all my energy to not sink. My chubbier sister (at the time) could float/swim laps around me. Thank you for such a wonderful story and recipe to start my day. A fellow swim lesson hater!!! Seemed unfair that we just couldn’t make it that far, didn’t it?! Thank you for writing and sharing, Robin. We need to start a method of swim lessons for kids that doesn’t not include that loooong pool! Seemed unfair that we just couldn’t make it that far, didn’t it?! Thank you for writing and sharing, Robin. I checked with Land-O-Lakes about water content of salted vs unsalted butter and it’s the same for both. The representative told me this is true regardless of brand. 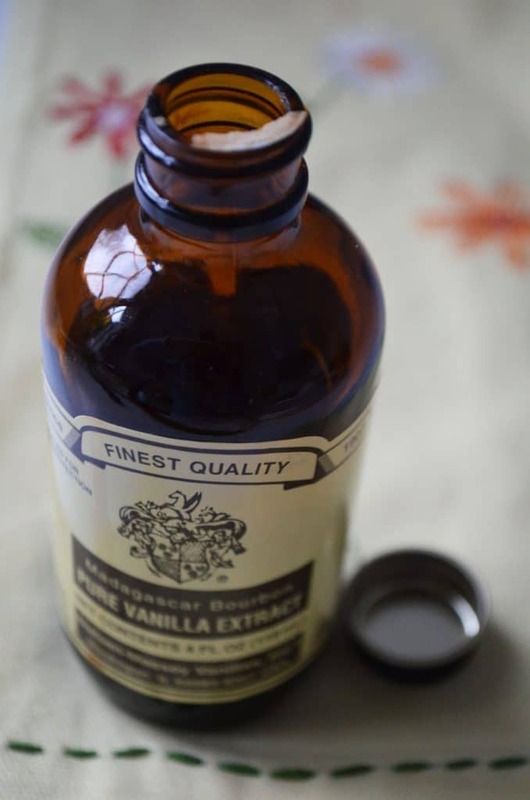 Butterfat contents of brands, however, can vary widely, typically from 80% to 85%, and that can have an effect on what you’re baking. 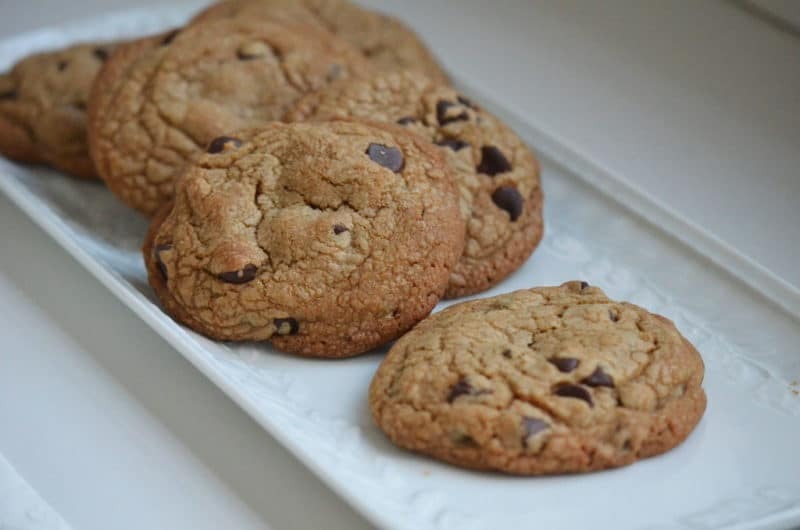 I’m a fan of this chocolate chip cookie recipe, too! Greg, our master baker, thanks for the great research! I’ve always understood the issue to include water content, so it’s good to know that’s not so much the problem. No doubt butterfat variation is the culprit. Also better to control your own salt measure. Yummy and wonderful Tammy! The butter question is important as it does seem to make a difference particularly when it comes to candy-making. Oh Maureen! I came for the cookies and stayed for the stories, which is often how it happens in life. What a treat to read this while snowed in at O’Hare waiting for a flight to New Orleans. I suddenly have an urge for warm choclatey cookies and a chat with old friends. You have the best lines, Tom! !Thank you and please have some raw oysters for me down in Cajun country (I know you won’t!!)!! Maureen, I LOVE this clincher line in your recipe method! Thanks for noticing that Toni!! Isn’t that what chocolate chip cookies are what it’s all about in the end?! xxoo. This recipe sounds perfect and the memories that accompany this are even more precious..
Jacki, what a pleasure to receive your comment. Thank you for reading and for sharing this with me…the life of the military family is one of real sacrifice on a lot of levels. No doubt there is also gratification for that sacrifice, but it’s something the rest of us can’t begin to fully appreciate. Enjoy the cookies! They are just delicious. And thanks again for joining me here. Hope to see you back! Jacki I love that you are making the cookies tomorrow and that you are enjoying Maureen’s blog. Isn’t she an amazing writer?? Maureen–once again I had tears in my eyes as I read this entry. What a beautiful tribute to Mrs. Georgi and to all the wonderful women on Wagon Wheel Lane. Thank you thank you Geralyn…so much to say about those wonderful years we all shared together, isn’t there? Ahemmmm….. Great stories Maureen, but ——– The big question is…..
Who’s eating all of these cookies? Thank you Paul. I guess I got you all back for making me cry at the funeral!! You are a special family indeed. Ok Maureen, you give new meaning to “Emotional Eating!” So beautifully written – I can just see you in the pool with Mrs. Georgi for your unofficial swim lesson. A great group of women indeed. Thank you Anne–yes, we are lucky to come from such greatness. Virginia of course leads the pack. Good for you Sarah not only for making a batch of these great cookies, but for trying out the egg beaters!! Great to know they are an option. I just ate one of the chocolate chip cookies warmed up. Might need to go back for another….. I love serendipity! And good neighbors, special ones like YOU. Thank you Cindy. I hope the cookies were a delight to make, to give, and to eat! So beautiful. What is it about chocolate chip cookies that just floods a heart with memories? I can only hope that my kids will remember these times when they bake cookies with their children. 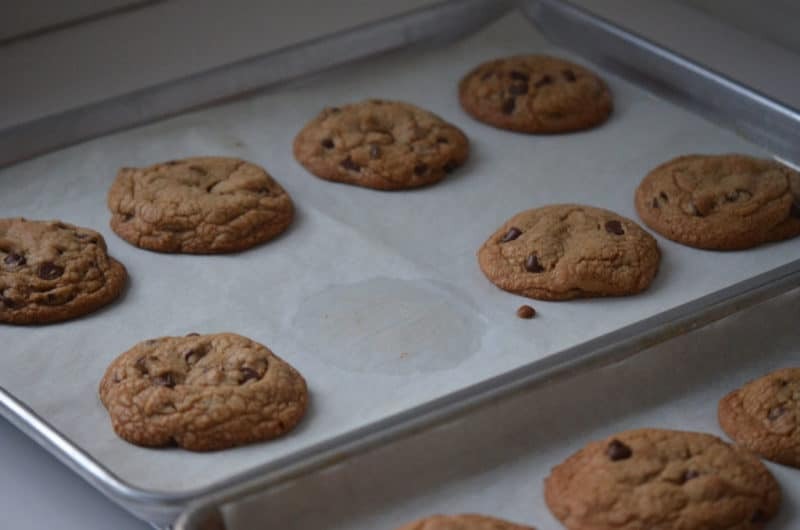 Lily, my 13-yr-old, actually baked our family chocolate chip cookies(from memory, no less!) this summer and won first place at the Huntington Woods Fourth of July Baking Contest! Mission accomplished! What a beautiful tribute to the many people who contributed so many wonderful things to your childhood! You are an amazing writer and your kindness, generous heart, and love for life shine through your writing. I’m anxious to try your recipe as I’m sure my family will enjoy it much more than the tube of chocolate chip cookie dough I recently ‘baked’ for them! How special Michelle, thank you so much. I love the stories, Maureen. Bark like a sonofabitch had me ROFL! Thanks for sharing. Been there done that but the dog’s name was Buster. I cannot wait to try this recipe! I love trying new chocolate chip cookie recipes. I’ll have to dig out my antique yellow pyrex bowl to mix them up in! Hi Maureen. 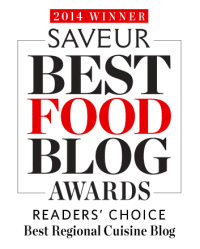 I just discovered your website and blog through Leite’s Culinaria. I loved reading your New Year memory about your Greek friend, Manya, and the dime in her sweet bread. 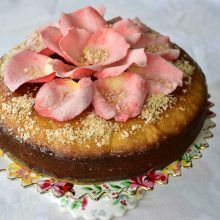 It made me check out your website and this story/recipe. You have a true talent for writing and cooking and I plan on making this recipe. I also plan on reading many of your other blogs and recipes. Thanks so much for sharing so much of yourself. Oh Deb, that is so kind, thank you so much and welcome here!